The Internet allows obsessive people to gather ‘round their obsessions and document the minute details surrounding a single aspect of life. Somewhere in the far reaches of the Internet I happened upon various groups of people who treat shaving like it’s some sort of hobby. Sociology might call this a tiny subculture. To you and me shaving is just one more thing we have to do. But to some people, shaving is their profession. There are people who collect razors, shaving mugs and creams, people who spend their evenings arguing the merits of different shaving creams; and people who restore shaving gear. What’s so great about these subcultures is that their years of expertise and trials can be condensed very quickly into a single recommendation. Novices can obtain answers that have taken years for experts to figure out. This can get us to that 80% proficiency without all the initial effort. Whats more, these subcultures have found all the outliers; the best deals, the vastly superior products. They know about the $80 headphones that sound like $200 headphones. In this story, they know about the blades that cost twenty cents a piece, but outperform the latest $3 razor cartridge. That’s what this blog is all about. Going straight to the answers, and more importantly finding answers to the questions we didn’t know to ask. Once upon a time, I had a consulting job. The kind where you had to wear a tie and shave every day. This was not awesome. Not only did I hate the process of shaving, but the results were massive razor burn and weird bumps always on the right side of my neck. Most everyone assumes they have sensitive skin. It turns out that we’ve just been using garbage razors and bad technique. While the number of blades keep multiplying and prices keep rising, the quality of the blades keeps decreasing. The more of this steel on our face, the more irritation. What we shave with is just as important as how we shave. When I switched to the best razor for men and learned more about shaving, the irritation went away. So let’s get started. My introduction to real shaving was made on a trip to California. I was working in Burbank but staying in Beverly Hills over the weekend. I had heard about The Shave in a magazine or newspaper and thought it might be fun to get a straight razor shave and a haircut before heading out to the clubs that night. The Shave is exactly what you would imagine a retro barber in Beverly Hills to be like. A regular shave takes about 45 minutes, which includes various layers of towels and oils, while what could only be a Victoria’s Secret model, massages your face. After the shave, the shampoo and a haircut followed. When I stepped out I was like a new man. I felt relaxed and refreshed. Now I know why girls spend so much money getting their nails done. It’s not so much the result as the process. When you feel good you, perform better. No amount of technique can compensate for a bad razor. The first answer to our shaving problems is the good old fashioned double edge safety razor. What makes these so great is the quality of the blades. If you look closely at your current disposable razors you’ll see the face of the blade has a pretty rough texture. Even cheap double edge blades are much smoother and much sharper. Though there are quite a few to choose from, the gold standard and best bang for your buck are the Merkur non-adjustable razors. They’re handmade in Solingen Germany and will last a couple lifetimes. I personally like the Merkur long handled variants. I have a pretty hefty beard and these cut a little better because of their increased weight. They’re also easier to set up. Just drop in a blade and screw on the handle. Pick up a Merkur Model 180 “23C” (most popular safety razor on amazon) or the 34C “hefty Classic”. Blades are a very personal thing. If you read through polls and comparisons you’ll find that there is no consensus on what blade is the best. Because of the variations in razor, technique, and skin, each model may perform differently for different people. Shave for a week using your current favorite. Shave for a week using a new brand (unless it’s just terrible). If the new blade is better it becomes your favorite. Test another the following week. If the new blade is worse, go back to your old favorite for a week and repeat the process. This gives a you a better feel for how good your current “best” blade is between experimenting with new blades. After a while it’s also good to run another series of tests as your razor or technique change over time. * note that Feathers are universally regarded as ninja assassin sharp. These probably aren’t the best to start with if you are relatively new to wet shaving. In a pinch, Walmart or CVS usually has double edge blades. Grab the Israeli blades if they have them. A 12 pack runs less than $2. When I traveled I would pick one of these up on our Monday evening grocery runs, which means I didn’t have to worry about airline rules. I had always wondered why my grandfather kept a coffee mug sitting on the bathroom sink. Despite years of progress he shaved the same way he did 60 years ago with a brush and shaving soap. It seems that he never found a reason to change. Once you try a good glycerin based shave soap, you’ll wonder why anyone ever bothered to make shaving creams from butane and alcohol. Glycerin is hygroscopic which means it holds water. Unlike the chemicals in your canned shaving cream which dry your skin, shaving soap delivers water to your face as you shave. When hydrated your beard becomes more elastic allowing for a much closer shave. For the good stuff, you’re looking for old British dudes. While prices are a little higher than the goo in a can, it also lasts a very long time because it’s highly concentrated. A tiny bit of shave soap, or cream makes a huge lather. My favorite by far is Geo F. Trumpers. Buy their sample pack. It comes with a 6 shaving creams, some cologne, and two samples of skin food (more on skin food below). It’s £8 and they ship for free. I keep the samples in my overnight bag with a disposable razor for emergencies. Trumpers makes both hard soaps and softer creams. It all comes down to personal preference. Hard limes shaving soap Soft violet shaving cream. On the cheap end, Mama Bear’s http://www.bear-haven.com/ has a massive number of natural glycerine shave soaps scented with essential oils, for $10. These are pretty good and last quite a long time. What’s more, there are a ton of scents if you like to experiment. Locally, you can sometimes find Poraso/C.O. Bigelow at Bath and Body Works, or old Italian groceries. It has a spicy Eucalyptus scent, which is a little less metro, and everyone swears by it. 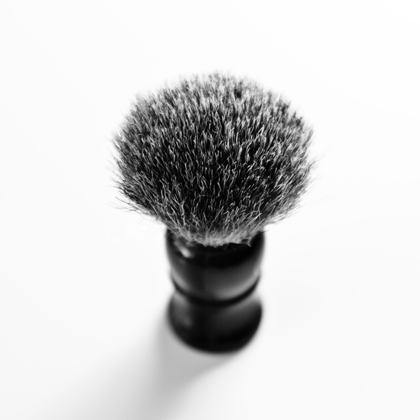 To make that shaving soap work, you need a shaving brush and a bowl or mug. When combined with hot water, the shaving brush turns soap into hot foam. The only way to go is badger hair. Synthetic brushes just don’t work the same. It makes a much thicker cream in about half the time because it holds more water.Note that all natural hair brushes will have a bit of a funky smell for the first few uses. This goes away. When selecting a brush, generally you get what you pay for. More expensive brushes use finer hairs and are generally larger. While brushes that cost upwards of $100 are not uncommon, you can get a great brush for $35 locally from Crabtree & Evelyn made by Edwin Jagger or online with the matching brush stand. The stand lets the brush dry facing down which is better. There are cheaper brushes out there, but this one won’t fall apart. Your local CVS or Walgreens will have a boars hair brush for about $8, but I don’t recommend them. If you’re looking for a brush to bring on the road, I have an old Crabtree & Evelyn made by Edwin Jagger that comes with a tiny cylindrical case. It appears to be discontinued, but Edwin Jagger makes an aluminum version. Your old man probably uses an alcohol based aftershave that smells like old man. You probably don’t want that. If you want your mind blown get some Trumpers Skin Food. It has a nice mild scent that goes away quickly and stops any burning. If you search around you’ll find that everyone raves about it. Pick up the sampler pack and try it out if it seems a bit pricey. I like the rose, but the lime, and sandalwood are also great. The pink seems a bit metro, but it rocks. Before you begin take a moment to examine your face. Feel the direction of the beard and take note of the contours. This will allow you to shave in the right direction and allow you to keep a more consistent blade angle while shaving. I should note that double edge blades are way sharper than you are probably used to. You may have to unlearn some bad habits from cartridge shaving, mainly to be more careful and deliberate. This can actually be a good thing as it makes you more conscious of what you’re doing. Rather than thinking about 100 other things, shaving gives you a moment to stop and focus on something simple. Zen shaving if you will. Softening your beard with warm water makes shaving much easier and allows for a closer shave. Although many people simply shave after showering, but showering first can strip your face of oils which help to protect your skin while shaving. If you are extremely sensitive, prep your face with a towel soaked in hot water and shave before showering. 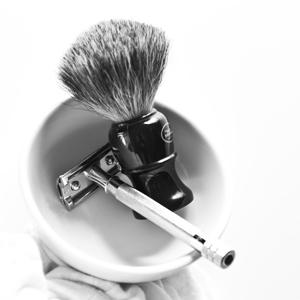 Place your shaving brush and bow in the sink and run some hot water to to let them warm up for a couple minutes. Empty the bowl and add about a dime sized amount of shaving cream (similar to what you would place on your toothbrush). Any old bowl will work, but one that’s large and deep is ideal. If you’re using a hard shaving soap, soak it briefly in warm water and run your shaving brush over the puck a few times to collect the soap. Whisk the shaving brush in the bowl for a couple minutes until your soap forms a soft peak with no breaks in the foam. This should look like cake batter. There should be enough foam for multiple passes and you can extract more foam by squeezing the brush gently outward. Use the brush to work the newly created foam into your face and beard for about 30 seconds. To keep your bowl warm let it sit in a bath of warm water left in the sink. Leave your brush in the bowl as well. The first step to a better shave is learning to shave gently, letting the razor’s weight do all the work. DO NOT PRESS DOWN. Divide your face into sections by contour. Shave one section at a time so that you don’t have to adjust the angle of the blade to the contour of your face with each stroke. The razor should be at about a 30 degree angle to your face to allow the blade to gently ride against the face. Focus on keeping this angle consistent. Each pass should reduce your beard rather than removing it all at once. Don’t shave over the same place twice in one pass. First Pass: Shave with the grain, or as a beginner, shave in a downward motion. This is the gentlest and least aggressive shave. After the first pass rinse with warm water but do not dry. Second Pass: Apply more lather and shave across the grain at a 90 degree angle. Rinse again with warm water. Third Pass (optional): For an even closer shave, lather again and go across the grain in the opposite direction and rinse. Fourth Pass (usually not needed): For those who can tolerate it, you can shave against the grain very gently for a fourth and final pass. This is very aggressive though, so it should be done with caution and may lead to irritation. When done, rinse with cold water for at least 30 seconds to remove soap residue and close the pores. Feel your skin for any missed or high spots so you can adjust your technique next time. Use a styptic pen to seal up any nicks or cuts. Apply skin food or non-alcohol based after-shave. By taking time to do consciously, that would otherwise be a chore, we can turn it into something enjoyable. Rather than thinking about a thousand other things, this gives us a chance to focus on something simple and slow down. Give it a try. How does one stop the bathroom mirrow from steaming up? Shaving after ashower always leaves me with bad results when I can not see what I’m doing. I usually run my hair dryer at the mirror for about a minute. It clears up pretty quick. Try rubbing a tiny bit of shaving foam into the mirror. I second this article. I’ve been wet-shaving for the past year and a half or so, and I will never, ever go back to the 5-blade monstrosities and neon green goop that pass for modern shaving. Sure, it takes longer, but the results are SO much better. I use Mama Bear’s shaving soap, and I love it. I found my razor and shaving mug at an antique store; with some old-fashioned elbow grease, my decades-old razor works like new and should continue to do so. For aftershave, I simply rub on some witch hazel: it has a fresh scent that goes away quickly, and it cools and soothes any rough areas. I’ve raved about wet-shaving to all of my guy friends, trying to convert them. Been shaving this way for 5-years now and it is far superior than whacking away in the shower (at your beard of course) with a vibrating-glow-in-the-dark-10-bladed-$5-a-head-Schick-whatever. But I really feel like shaving after a shower is better; to each their own. I do suggest for anyone not too caught up in what people may think if they rummage through your medicine cabinet trying Nancy Boy out of San Francisco. They make a cream that is even better than the old English standbys. Try the original scent. I love it so much I bought the essential oil and use it on cotton balls as car air freshener. This really need to step up my shaving game… I’ve been using barbarsol and a mac 3 for years now. Have you checked out the Dollar Shave Club? Any idea if their $1 blades are any good?